The European American Armory Corporation, of Sharpes, Florida , announced the 9mm FAR cartridge in 2000. The name “FAR” is an acronym for “Fast, Accurate, Reliable.” The cartridge is an interesting design, having outer dimensions similar to many other rounds based on the Mauser 10mm head, and of 9mm caliber. Case length of a measured, new unprimed empty case is 23.96m/m (0.9435”). However, the cartridge has an internal case capacity (powder chamber) approximately equal to that of the 9mm Parabellum cartridge. This is accomplished by raising the height of the web, as seen in the photograph. The concept of reducing case capacity in long cartridge cases is not new. It has been done with older rifle cases designed for black powder, to insure safe and reliable ignition of smaller, smokeless-powder loads. However, the concept behind the production of this round does seem to be new. The thicker web of the case allows the use of a relatively powerful cartridge in self-loading pistols of blowback operation, without an overly heavy pistol or recoil spring.. 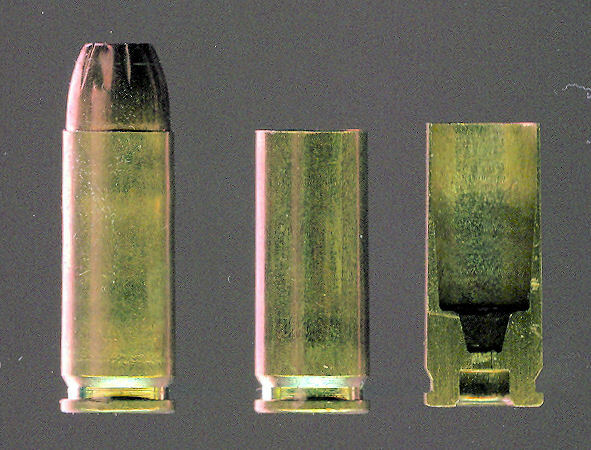 Although the cartridge is leaving the chamber before the bullet has exited the barrel, a condition that normally could cause the case head to blow out, that portion of the base of the case is almost solid brass. By the time the thinner portion of the case has left the chamber, the projectile has exited from the barrel, and pressure has dropped to safe levels. The FAR System allows conversion of existing, locked breech pistol designs, to straight blowback operation. Claims are made that the fixed, straight-line barrel improves accuracy and decrease cycle time and battery alignment. While fixed-barrel guns are often more accurate than those that tilt, rotate, or otherwise move in the locking/unlocking cycle, modern computer-guided machinery and custom fitting have made normal, locked-breech pistols about as accurate as barrel quality will allow. Still, it is an interesting concept. Lapua announced that they would be supplying loaded ammunition with a 124 grain FMJ RN bullet in the Spring of 2001. In 2008, we have still not seen a load that we could identify as being of factory production. The loaded cartridge shown in our picture is a handload. All that we know to have been available are new, unprimed cases, such as the center item in our picture, and even those seem to have disappeared from the market. We have no positive information on the subject, but the absence of this round from any current advertising, either by Lapua or EAA Corporation (Armi Tanfoglio in Europe ) would indicate that the cartridge is, at least for now, a dead issue.